Convatec Versiva 403206 - a top quality wound care product by Convatec! ADW Diabetes has a wide range of these and other wound care supplies at great prices. You are viewing Convatec Versiva With Hydrofibre, 5.5." 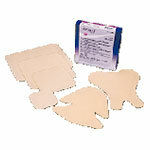 X 5.5", Sold By Box Of 10. by Convatec, a leading manufacturer of wound care supplies. ADW Diabetes carries a wide range of Convatec wound care products, including Eakin, Combiderm, Versiva, Duoderm, and many more, at every day low prices. Please review the size, style, and quantity carefully before ordering. If you have any questions on this wound care supply or any other products from Convatec, please call our customer care specialists toll free at 877-241-9002.